Somebody call Catherine Zeta-Jones, because I have a laser tripwire. The laser diode is just connected to 5V and ground, so it's always on. 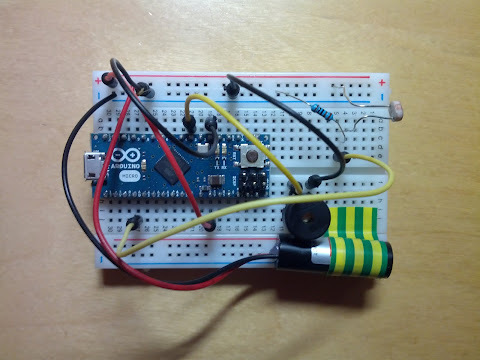 The piezo buzzer is connected to digital pin 3 on the Arduino and ground so that we can sound the alarm when the laser beam is broken. The photocell is connected in a voltage divider configuration. One leg of the photocell is connected to 5V, the other to ground through a resistor and to analog pin 0 on the Arduino. The way a photocell works is that it changes its resistance depending on light intensity. When the laser beam hits it, the resistance will be lower than when it doesn't. With the voltage divider, we can read a value on the Arduino's analog pin that will depend on the photocell's resistance and thus detect if the laser beam was broken. Depending on the photocell's resistance range, we choose the value of the fixed resistor so that we can have a reasonable threshold value for the output voltage. Here's the sketch that's running on the Arduino.